This article is about the Vedic ritual. For concurrent Hindu usage, see Homa (ritual). For the avatar of Vishnu, see Yagya (avatar). "Yagam" redirects here. For the 2010 film, see Yagam (2010 film). For the 2004 film, see Yagnam (2004 film). Yajna (IAST: yajña) literally means "devotion, worship, offering", and refers in Hinduism to any ritual done in front of a sacred fire, often with mantras. Yajna has been a Vedic tradition, described in a layer of Vedic literature called Brahmanas, as well as Yajurveda. The tradition has evolved from offering oblations and libations into sacred fire to symbolic offerings in the presence of sacred fire (Agni). 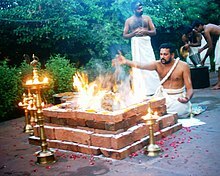 Yajna rituals-related texts have been called the Karma-kanda (ritual works) portion of the Vedic literature, in contrast to Jnana-kanda (knowledge) portion contained in the Vedic Upanishads. The proper completion of Yajna-like rituals was the focus of Mimansa school of Hindu philosophy. Yajna have continued to play a central role in a Hindu's rites of passage, such as weddings. Modern major Hindu temple ceremonies, Hindu community celebrations, or monastic initiations may also include Yajna vedic rites, or alternatively be based on agamic rituals. The word yajna (Sanskrit: यज्ञ; yajña) has its root in the Sanskrit yaj meaning "to worship, adore, honor, revere" and appears in the early Vedic literature, composed in 2nd millennium BCE. In Rigveda, Yajurveda (itself a derivative of this root) and others, it means "worship, devotion to anything, prayer and praise, an act of worship or devotion, a form of offering or oblation, and sacrifice". In post-Vedic literature, the term meant any form of rite, ceremony or devotion with an actual or symbolic offering or effort. A yajna included major ceremonial devotions, with or without a sacred fire, sometimes with feasts and community events. It has, states Nigal, a threefold meaning of worship of the deities (devapujana), unity (sangatikarana) and charity (dána). The Sanskrit word is related to the Avestan term yasna of Zoroastrianism. Unlike the Vedic yajna, however, the Yasna is the name of a specific religious service, not a class of rituals, and they have "to do with water rather than fire". The Sanskrit word is further related to Ancient Greek ἅζομαι (házomai), "to revere", deriving from the Proto-Indo-European root *Hyeh₂ǵ- ("to worship"). Yajña, sacrifice, is an act by which we surrender something for the sake of the gods. Such an act must rest on a sacred authority (āgama), and serve for man's salvation (śreyortha). The nature of the gift is of less importance. It may be cake (puroḍāśa), pulse (karu), mixed milk (sāṃnāyya), an animal (paśu), the juice of soma-plant (soma), etc; nay, the smallest offerings of butter, flour, and milk may serve for the purpose of a sacrifice. The later Vedic Upanishads expand the idea further by suggesting that Yoga is a form of Yajna (devotion, sacrifice). The Shvetashvatara Upanishad in verse 1.5.14, for example, uses the analogy of Yajna materials to explain the means to see one's soul and God, with inner rituals and without external rituals. It states, "by making one's own body as the lower friction sticks, the syllable Om as the upper friction sticks, then practicing the friction of meditation, one may see the Deva who is hidden, as it were". The Brahmin is the superintendent of the entire performance, and is responsible for correcting mistakes by means of supplementary verses. There were usually one, or three, fires lit in the center of the offering ground. Oblations are offered into the fire. Among the ingredients offered as oblations in the yajna are ghee, milk, grains, cakes and soma. The duration of a yajna depends on its type, some last only a few minutes whereas, others are performed over a period of hours, days or even months. Some yajnas were performed privately, while others were community events. In other cases, yajnas were symbolic, such as in the Brihadaranyaka Upanishad hymn 3.1.6, where "the mind is the Brahmin of sacrifice" and the goal of sacrifice was complete release and liberation (moksha). Yajnas, where milk products, fruits, flowers, cloth and money are offered, are called homa or havanam. A typical Hindu marriage involves a Yajna, where Agni is taken to be the witness of the marriage. A Yajna Vedi (square altar) with Samagri (offerings) on left, and a Yajna in progress (right). The Vedic yajna ritual is performed in modern era in a square altar called Vedi (Bedi in Nepal), set in a mandapa or mandala or kundam, wherein wood is placed along with oily seeds and other combustion aids. However, in ancient times, the square principle was incorporated into grids to build large complex shapes for community events. Thus a rectangle, trapezia, rhomboids or "large falcon bird" altars would be built from joining squares. The geometric ratios of these Vedi altar, with mathematical precision and geometric theorems, are described in Shulba Sutras, one of the precursors to the development of mathematics in ancient India. The offerings are called Samagri (or Yajāka, Istam). The proper methods for the rites are part of Yajurveda, but also found in Riddle Hymns (hymns of questions, followed by answers) in various Brahmanas. When multiple priests are involved, they take turns as in a dramatic play, where not only are praises to gods recited or sung, but the dialogues are part of a dramatic representation and discussion of spiritual themes. The Vedic sacrifice (yajna) is presented as a kind of drama, with its actors, its dialogues, its portion to be set to music, its interludes, and its climaxes. A miniature illustration of a falcon bird Athirathram yajna altar built using the square principle. The Brahmodya Riddle hymns, for example, in Shatapatha Brahmana's chapter 13.2.6, is a yajna dialogue between a Hotri priest and a Brahmin priest, which would be played out during the yajna ritual before the attending audience. Who is that is born again? It is the moon that is born again. And what is the great vessel? The great vessel, doubtless, is this world. Who was the smooth one? The smooth one, doubtless, was the beauty (Sri, Lakshmi). What is the remedy for cold? The remedy for cold, doubtless, is fire. A Vedic Yajna plays a central role in Hindu weddings. Agni and yajna play a central role in Hindu weddings. Various mutual promises between the bride and groom are made in front of the fire, and the marriage is completed by actual or symbolic walk around the fire. The wedding ritual of Panigrahana, for example, is the 'holding the hand' ritual as a symbol of their impending marital union, and the groom announcing his acceptance of responsibility to four deities: Bhaga signifying wealth, Aryama signifying heavens/milky way, Savita signifying radiance/new beginning, and Purandhi signifying wisdom. The groom faces west, while the bride sits in front of him with her face to the east, he holds her hand while the Rig vedic mantra is recited in the presence of fire. The Saptapadi (Sanskrit for seven steps/feet), is the most important ritual in Hindu weddings, and represents the legal part of Hindu marriage. The couple getting married walk around the Holy Fire (Agni), and the yajna fire is considered a witness to the vows they make to each other. In some regions, a piece of clothing or sashes worn by the bride and groom are tied together for this ceremony. Each circuit around the fire is led by either the bride or the groom, varying by community and region. Usually, the bride leads the groom in the first circuit. The first six circuits are led by the bride, and the final one by the groom. With each circuit, the couple makes a specific vow to establish some aspect of a happy relationship and household for each other. The fire altar or the Yajna Kunda is square. The Pakayajnas — They are the aṣtaka, sthālipāka, parvana, srāvaṇi, āgrahayani, caitri and āsvīyuji. These yajnas involve consecrating cooked items. Soma Yajnas — Agnistoma, atyagnistoma, uktya, shodasi, vājapeya, atirātra and aptoryama are the Soma Yajnas. Havir Yajnas — They are the agniyādhāna, agni hotra, Darśa-Pūrṇamāsa, āgrayana, cāturmāsya, niruudha paśu bandha, sautrāmaṇi. These involve offering havis or oblations. The five panca mahā Yajñās, which are mentioned below. Vedavratas, which are four in number, done during Vedic education. The remaining sixteen Yajnas, which are one-time samskāras or "rituals with mantras", are Sanskara (rite of passage): garbhādhānā, pumsavana, sīmanta, jātakarma, nāmakaraṇa, annaprāśana, chudākarma/caula, niskramana, karnavedha, vidyaarambha, upanayana, keshanta, snātaka and vivāha, nisheka, antyeshti. These are specified by the gṛhya sūtrās. (clockwise from left top corner) Rishi, Pitri, Bhuta, Manushya and (centre) Deva yajnas. The nature of Vedic sacrifice and rituals evolved over time, with major changes during the 1st millennium BCE, changes that influenced concepts later adopted by other traditions such as Buddhism. Early Vedic period sacrifices involved animal sacrifice, but the rituals were progressively reinterpreted over time, substituting the offerings and making it non-violent or symbolic, with the superiority of knowledge and celebration of sound of mantra replacing the physical offerings. Ultimately, the external rituals were reformulated and replaced with "internal oblations performed within the human body". These ideas of substitution, evolution from external actions (karma-kanda) to internal knowledge (jñana-kanda), were highlighted in many rituals-related sutras, as well as specialized texts such as the Brihadaranyaka Upanishad (~800 BCE), Chandogya Upanishad, Kaushitaki Upanishad and Pranagnihotra Upanishad. The Vedic text Satapatha Brahmana defines a sacrifice as an act of abandonment of something one holds of value, such as oblations offered to god and dakshina (fees, gifts) offered during the yajna. For gifts and fees, the text recommends giving cows, clothing, horses or gold. The oblations recommended are cow milk, ghee (clarified butter), seeds, grains, flowers, water and food cakes (rice cake, for example). Similar recommendations are repeated in other texts, such as in the Taittiriya Shakha 2.10 of the Krishna Yajurveda). Tadeusz Skorupski states that these sacrifices were a part of ritual way of life, and considered to have inherent efficacy, where doing these sacrifices yielded repayment and results without the priests or gods getting involved. These Vedic ideas, adds Skorupski, influenced "the formulation of Buddhist theory of generosity". Buddhist ideas went further, criticizing "the Brahmins for their decadence and failure to live in conformity with the Brahmanic legacy of the ancient Brahmins", who claimed the Vedic ancients "lived in self restraint, were ascetics, had no cattle, no gold, and no wealth". The Buddha sought return to more ancient values, states Tadeusz Skorupski, where the Vedic sages "had study as their grain and wealth, guarded the holy life as their treasure, praised morality, austerity and nonviolence; they performed sacrifices consisting of rice, barley and oil, but they did not kill the cows". ^ M Dhavamony (1974). Hindu Worship: Sacrifices and Sacraments. Studia Missionalia. 23. Gregorian Press, Universita Gregoriana, Roma. pp. 107–108. ^ Jan Gonda (1980). Handbuch Der Orientalistik: Indien. Zweite Abteilung. BRILL Academic. pp. 345–346. ISBN 978-90-04-06210-8. ^ Hazen, Walter. Inside Hinduism. Lorenz Educational Press. ISBN 9780787705862. P. 34. ^ Prasoon, Ch.2, Vedang, Kalp. ^ "Is Sacrificial Killing Justified? from the Chapter "The Vedas", in Hindu Dharma". kamakoti.org. Retrieved 2019-03-09. ^ a b Gopal, Madan (1990). K.S. Gautam, ed. India through the ages. Publication Division, Ministry of Information and Broadcasting, Government of India. p. 79. ^ a b c d e f g h i j k l m Tadeusz Skorupski (2015). Michael Witzel, ed. Homa Variations: The Study of Ritual Change Across the Longue Durée. Oxford University Press. pp. 78–81. ISBN 978-0-19-935158-9. ^ Deussen, Paul (1997). Sixty Upanishads of the Veda. Motilal Banarsidass. pp. 645–651. ISBN 978-81-208-1467-7. ^ Tadeusz Skorupski (2015). Michael Witzel, ed. Homa Variations: The Study of Ritual Change Across the Longue Durée. Oxford University Press. pp. 79–84. ISBN 978-0-19-935158-9. ^ a b Tadeusz Skorupski (2015). Michael Witzel, ed. Homa Variations: The Study of Ritual Change Across the Longue Durée. Oxford University Press. pp. 86–87. ISBN 978-0-19-935158-9. ^ a b c d e Klaus K. Klostermaier (2007). A Survey of Hinduism: Third Edition. State University of New York Press. pp. 125–127. ISBN 978-0-7914-7082-4. Agrawala, Vasudeva Sharana. India as known to Pāṇini: a study of the cultural material in the Ashṭādhyāyī. Prithvi Prakashan, 1963. Dallapiccola Anna. Dictionary of Hindu Lore and Legend. ISBN 0-500-51088-1. Gyanshruti; Srividyananda. Yajna A Comprehensive Survey. Yoga Publications Trust, Munger, Bihar, India; 1st edition (December 1, 2006). ISBN 8186336478. Krishnananda (Swami). A Short History of Religious and Philosophic Thought in India. Divine Life Society, Rishikesh. Nigal, S.G. Axiological Approach to the Vedas. Northern Book Centre, 1986. ISBN 81-85119-18-X. Prasoon, (Prof.) Shrikant. Indian Scriptures. Pustak Mahal (August 11, 2010). ISBN 978-81-223-1007-8. Vedananda (Swami). Aum Hindutvam: (daily Religious Rites of the Hindus). Motilal Banarsidass, 1993. ISBN 81-20810-81-3.